In a former article, we wrote about our Surrey movers looking at Langley housing options. In this article, our Richmond movers will take a look at Richmond housing options. If you are thinking of moving, and are looking for a city to move to that will match your budget and lifestyle preferences, read on to learn more about the considerations of moving to Richmond. First of all, we’ll give you a bit of a background on moving to Richmond and what it’s like to live there. It’s really close to the Vancouver International Airport. This not only provides easy access to frequent travellers, but also makes for great parks near the airport for leisurely activities, aviation business opportunities, and more. It has easy access to public transportation options (if you commute to work in a larger city like Vancouver). It hosts the Olympic Oval, if you’re into ice skating and sports. It is bustling as a community with Asian flare, including Asian shopping malls and several Asian food joints. Not to mention, the Richmond Night Market. It’s quaint town of Steveston has a lot of history and, among other things, is the filming location for a popular TV show, Once Upon A Time (if that excites you or brings tourism business ideas to mind). 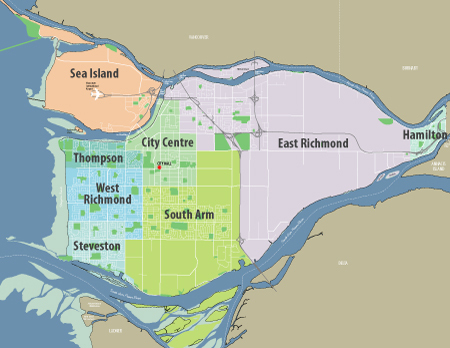 There are multiple communities to choose from if you are looking to move to Richmond; some are near city scenes, and others are nearer to remote, farm-land type areas (though these are succumbing to large mega homes as of late). If you want to move to a farm in Richmond, and the cost seems prohibitive, check out this article for alternative ways to achieve this dream. While every community has it’s downsides, our Richmond movers will point out a few things you may want to know before you decide to move to Richmond. It is loud! This is mostly because the airport is nearby. This may affect residents closer to the Airport area, along Bridgeport, Cambie and the more North and Western parts of the city. Planes are loud when they take off, sounding like thunder that comes perhaps a few times an hour or so. Residents who live in the city could say that they get used to the noise. But for newcomers, it can be an adjustment. And, for some residents, it’s not just the roaring take offs of planes to complain about, it’s also other mechanical work being done at the airport. School options may be limited as time continues, as this article shows. While not a typical, run-of-the-mill thing to happen in the area, recently some racist propaganda was delivered to Richmond residents. This may have been a rare occurrence as a result of the recent U.S. election. The city bears an earthquake risk. Many know that B.C. is due for a “big one”(meaning a large earthquake). Residents of the city often are told that the low-lying land in Richmond could mean flooding in the area in the event of an earthquake. This report says that is not likely, especially with recent upgrades to infrastructure. And this news report, while it states Richmond could shake more than previously thought in an earthquake, also points out that upgrades to seismic codes for buildings should prevent extensive damage. The city ranks 52/100 for murder rates in cities across Canada (though there seem to be a lot on the 100 rank in that report…). Whether that’s reasonable or not would be relative to your perception and tolerance level for safety standards. There are current reports of illegal hotel operations for newcomers to Canada, which have raised complaints. Though, these illegal hotels are not unique to the city, as we have seen with the news surrounding the legality of Airbnb rentals. And it’s worth mentioning the Airbnb phenomenon can make any ‘innocent’ neighbourhood an issue for residents. There are several empty homes in Richmond, which may be a sign of a real estate issue for home investors to be aware of. Keep in mind that most new housing developments in Richmond are going to be condos. And these are growing. What does it cost to move to Richmond? Richmond housing options are not cheap. That’s not to say you couldn’t get a lower-priced condo in the area, comparatively speaking. But remember, there is cost, and there is value for purchase. The same site also paints a grim picture for renters, who will face higher rental rates due to the very low rental vacancy rate in the city. In short, there is more demand for rentals, resulting in higher prices because of lack of supply. However, with the city’s affordable housing strategy, there may be more options for lower-income families to move to Richmond. For people buying farmland, there are tax breaks that could make that type of property more affordable. However, keep in mind these tax loopholes are being abused, and could be cracked down upon given the media attention they are getting. If you get the chance to move to Richmond, you may enjoy your new lifestyle and the quaint, ‘small-big-city’ feeling of the area. However, as we’ve covered in this article, the option to live in Richmond may not be for everyone. Aside from affordability, you’ll need to consider noise levels, earthquake insurance, and other issues that could eventually affect your real estate investment. That said, Richmond’s real estate scene doesn’t seem to be dying down, as the new condo developments show us. If you’re making a move to Richmond, you might need the services of a professional moving & storage company. Give Ferguson Moving and Storage a call at 604-922-2212 or request a quote online through our website!